That's sometimes the problem with blurbs and when I see a long text, I always try to skip most parts. It's no fun when you already know the whole story. I agree that the premise for this is an interesting one. It's why I was initially drawn to this book in the first place (that and because of The Assassin's Curse), but I think I am certain now that I won't enjoy this. I feel the same way about likeable/unlikeable characters. I am completely fine with characters who have personality flaws, but not to the extent when connecting with them becomes an issue. Sorry this didn't work for you, Keertana! Lovely, helpful review as always. augh, it doesn't sound like Cat and I will get along. I heard pretty good things about the first one and pretty mixed things about this. sorry you didn't enjoy it more! I'm sorry you didn't enjoy this one, dearest. I just finished and loved it, but I think that's down to personal taste. I can see everything you said, but whilst I don't think Cat was "likeable" I could connect with her and the novel wasn't perfect, but I did find it moving. I liked the tragicness of the situation and I fell in love with Finn. Still, I'm in agreement with you about the synopsis, they are terrible. They don't nearly summarise the stories good enough. Nevertheless we have The Pirate's Wish to look forward to in June! Yes. Although my rating is a bit higher than yours, I pretty much thought everything you did. Cat was downright infuriating, and I didn't feel that she was ever redeemed either. It's more like she just ran out of options. Another thing that bothered me immensely was that she never told her ex husband the you-know-what. I mean, I know that he was a jerk, but by God, she was too, and not telling him seemed like such a horrible thing to do. Fantastic review, Keertana. So eloquent... as always. "More important, however, Cat is an unlikable character like no other; unlikable to the point where she's quite literally a bad person, not someone who is good and has their flaws." Well that's certainly a problem isn't it? I love characters who have some moral ambiguity to them and exist in darker shades of gray, but I need there to be some vulnerabilities and redeeming qualities in there somewhere. I don't think this is a book I'll be rushing out to buy Keertana! I wasn't planning on reading this one anyway, but the issues you had sounds like ones I would have as well. In fact this sounds like one that one infuriate me. Kudos for sticking with it! I am so put off by the sound of the MC, I would need more than what she's offering us as the reader to be able to connect with this book. "Unfortunately, I didn't even feel much for this main romance since I was too preoccupied coming up with ways to murder the main character, Cat"
Ok that made me giggle. :-) I'm so sorry this one didn't work out for you, but I'm also incredibly grateful to have read your review. I adore sci-fi novels involving robots/cyborgs/AI. This synopsis would have sucked me in, but now I won't waste my time. There's nothing I hate more than being disappointed by poor execution of a fantastic premise. There are so many intelligent, well-written sci-fis that do address the philosophical and political implications of robots/AI co-existing with humans, sans angst-ridden romance. I'll definitely skip this one. Thanks for your thoughtful review, Keertana! You're right - the premise does sound interesting. How frustrating that the story doesn't live up to that potential! And really disliking the protagonist is never a fun thing to do. Let's hope the sequel to the Assassin's Curse is better than this seems to be. Yes yes yes! So much wasted potential. And the Cat hatred! I mean I NEVER condone abuse in relationships, and I didn't here either, but at the same time I felt more pity for Cat's husband than I did for her. Sure, he got physical and that was UNFORGIVABLE, but he really loved her and she treated him like crap. UGH. So glad you were totally with me on this one. Also you're right--her synopsis are terrible. I actually liked the sound of this one but oh well. If I don't like the character, I will probably not like the book all that much. They're very important in my opinion and if they're not good (most times we're reading the book from their pov) how can we like the rest of the book? I'm sad this one didn't work for you! This was the best book I have read since The Time Traveler's Wife (that was in 2007 or 2008). 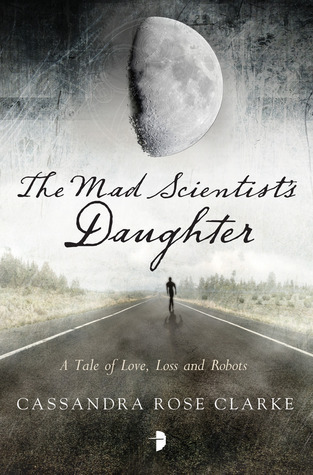 I'd say The Mad Scientist's Daughter is kind of a combination of that book and Edward Scissorhands, so if you like either of those stories, you'll definitely love this book.